Yo Azama (center) was named the National Language Teacher of the Year in Denver, Colorado. Yo Azama, a 41 year-old Japanese teacher from Tomishiro City currently working at North Salinas High School in Salinas, California, was named as the National Language Teacher of the Year by the American Council on the Teaching of Foreign Languages (ACTFL) which is based in Virginia. Azama was chosen from 6500 foreign language teachers, and was lauded by the ACTFL for his unique method of teaching Japanese. 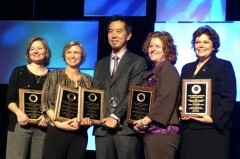 The award ceremony took place at the ACTFL’s annual convention held in Denver, Colorado on November 18. Azama was selected as the outstanding foreign language teacher in California on April 2010, and is very happy to have now received the national award. Other regional finalists for this year’s national award were a German teacher in Washington, a French teacher in Maryland and a Spanish teacher in Missouri, and a Chinese teacher in Florida, so Azama came first in an internationally diverse competition. At the ceremony, Azama said, “The world needs people to have a deeper understanding of each other. One student, one colleague, one friend at a time – we are changing the world little by little.” He thanked his students for inspiring him every day. Azama graduated from Okinawa Prefectural Tomishiro Minami High School and went to the United States 17 years ago after acquiring a Bachelor of Arts in Music from Showa Academia Musicae in Kanagawa. He graduated from California State University in Monterey Bay and then started teaching. For 16 years he has been teaching at elementary schools, junior and senior high schools, and since 2000 he has taught Japanese at all levels at North Salinas High School. Azama’s hobbies are playing the jazz piano, surfing and hiking. He has published several books in the field of Japanese language education. His mother, Keiko Azama, and his niece, fifth-year student 11 year-old Kanon Azama of Takara Elementary School, went to the United States to celebrate Azama’s winning this award.